Firstly apologies because the Wave 24 review will be a ship short. It seems that the repaint of the USS Enterprise NCC-1701 is already out of stock due to stupid levels of demand so we are only privy to the IKS Drovana and the IRW Algeron for June. 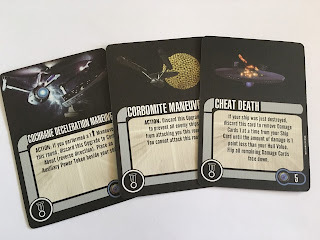 The big thing you'll immediately notice is that there have been some shakeups in the waves with shuttles, warbirds and Xindi ships seemingly cast aside for a trio of reboxes. However while this is true of the Enterprise it's not strictly speaking the case for the Drovana or the Algeron. The Drovana is the first time since the Starter Pack that we've had a Vor'Cha Class Attack Cruiser released to retail and it's been worth the wait just for the playing piece. The matt green paint now has a slight metallic glint to it and the surface detail really stands out. It's a thinner paint job certainly but the engine colouring is much more accurate and really makes a difference to the ship as you can see from the comparison. The second craft, the Algeron is a bit disappointing just for the fact it's the same old K'T'inga/D7 mould to the point that it's even carrying a Klingon emblem on the underside. Straight rebox if ever there was one! Still the entire pack is purely Romulan themed and, contrary to the scattered focus of the Drovana it's based around the classic third season episode, The Enterprise Incident. 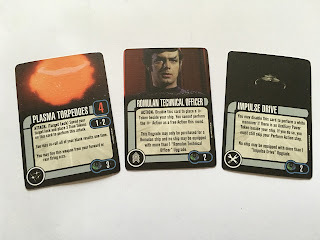 Sadly there's no Romulan imposter Kirk (now there's a card - dual faction, high skill...) but we do get lots of tasty new goodies to take your mind off the very average model. Offering five in attack, one agility, five hull and three shields, the Drovana will be able to hold its own in a battle and costs 28 points for the ship. You can upgrade her with a Tech, two Weapon and a Crew upgrade as well as being able to utilise four standard actions - Evade, Target Lock, Cloak and Sensor Echo. As a unique action you can discard a non-disabled upgrade during Compare Results to cancel out a Damage or Critical Damage result. The accompanying generic ship holds the same stats as the version in the Starter Pack, losing a shield, a Weapon slot and the unique action for 26 points. In terms of movement, we have a max speed of four with red 90 degree turns and a red Come About at speed three. There are also green forward and bank turns at speeds one and two. 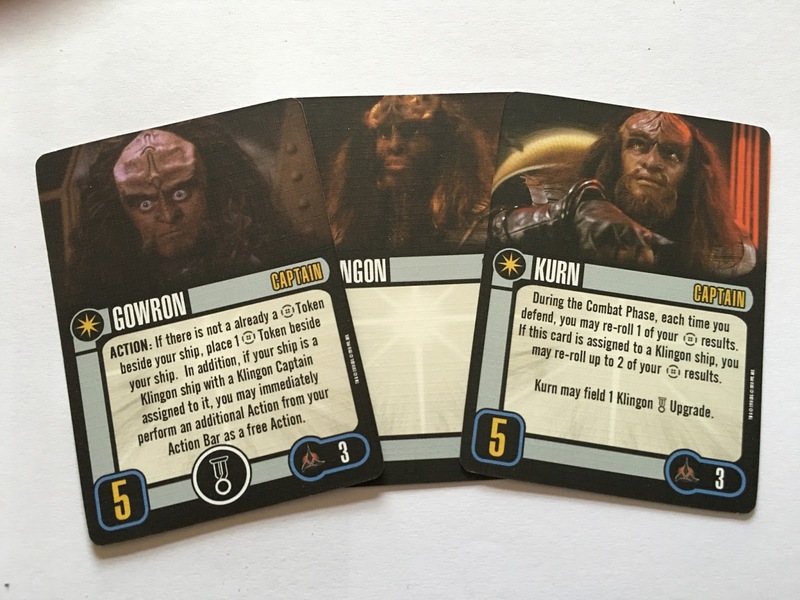 Unusually the Drovana comes with two equally strong command options in Gowron and Kurn. For a cost of three points and with a skill of five. Also allowing you to equip him with an Elite Action, Gowron can be used as a Fleet Admiral however, oddly, he won't improve your captain's skill but will be able to pass his skill across to another of your ships. What he does offer in that case is the chance to drop a Battle Stations token next to your ship and, if you're a Klingon captain on a Klingon ship, the opportunity to then perform an Action Bar action as a freebie. Seeing as the Drovana doesn't carry Battle Stations it's a very useable feature that doesn't leave you disabling features. Kurn also costs three points and has a skill of five and allows you to re-roll one of your Battle Station results each time you defend. If it's assigned to a Klingon ship you can re-roll two. Nice card to use since it offers improved defence and costs nothing extra - no Auxiliary Power Tokens, disabling cards or removal of upgrades. Low cost, big value. He can also field a Klingon Elite Action even though he doesn't have the emblem on the card. As for that Elite Action, the Drovana comes with Detonation Codes for four points. 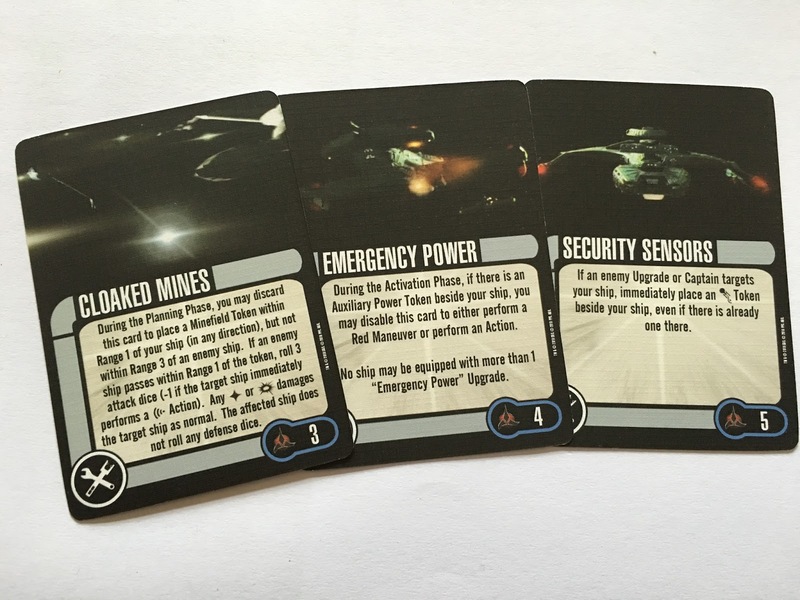 An Action, it allows you to target a Minefield Token within range and then roll the number of attack dice on the Mine card minus one. It results in every ship within range one of the mine to suffer Damage or Critical Damage as normal and without the chance of using any defence against the results. Of course it does rely on there being a minefield in play! 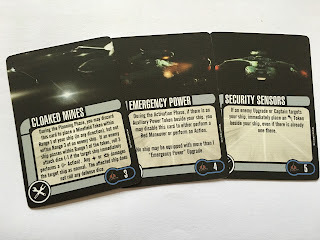 Which is a good thing that Cloaked Mines is one of the three new Tech options. 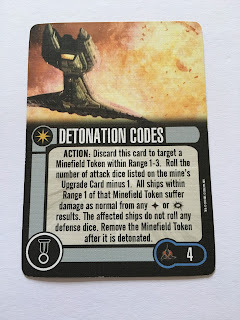 A discard for three points, it lets you drop the Minefield token within range one of your ship but not within range three of an enemy vessel. If any enemy ship passes within range one of the token it has to roll three attack dice and suffer the consequences of any Damage or Critical Damage results. The craft does not get the chance to roll any defence in this case which is standard against such an item. Second there's Emergency Power costing four points. Effectively it allows you to ignore any Auxiliary Power Tokens you have in play on that vessel and perform either a red manoeuvre or an Action. Certainly super-useful and reusable since it's a disable not a discard. Certainly a card that will help you get out of a sticky spot quickly. The final Tech upgrade is Security Sensors costing five points. If you're targeted by an enemy captain or upgrade you can immediately place an Evade in play even if you already have one active. Good news here that it's something you can keep on using and therefore an absolute essential to any Klingon fleet because of its reuse factor and increased defence. 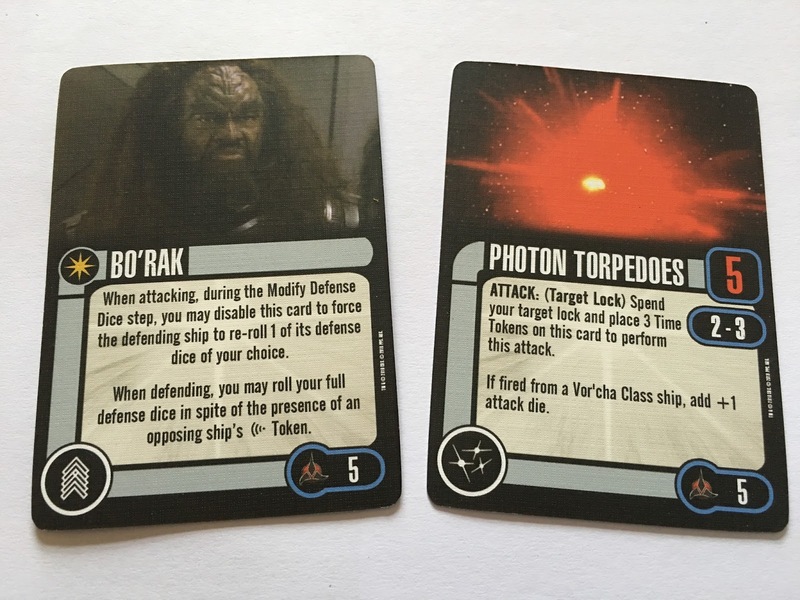 Bo'Rak is your new Crew option (five point cost) and can be disabled to force a defending ship to re-roll a die of your choice. He also allows you to defend with a full set of dice even if your opponent is fielding the Scan token. 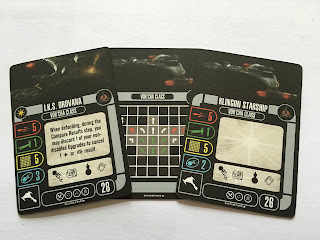 As you might be seeing, this is a Klingon set which offers a lot of increased defensive chances which, for a ship with a single agility point, will be very advantageous. 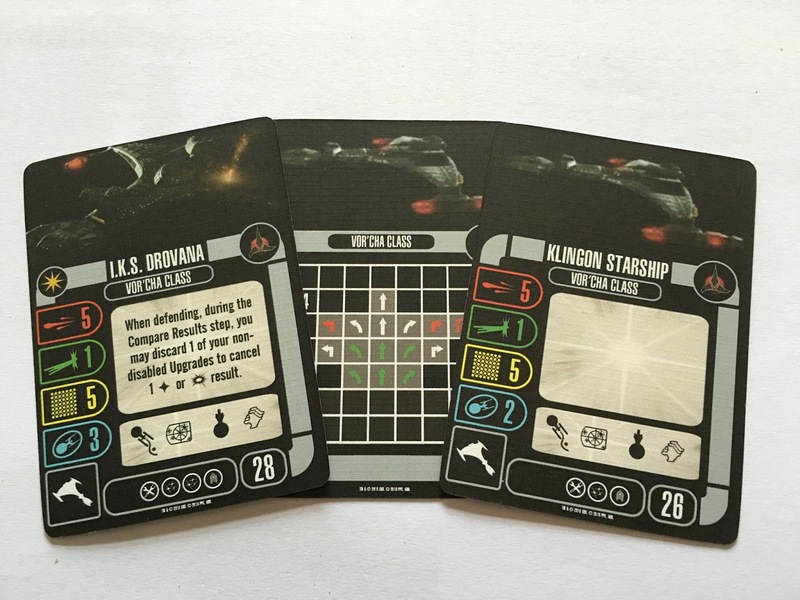 For a Klingon vessel the offensive capabilities are a bit limited beyond the standard five attack dice. 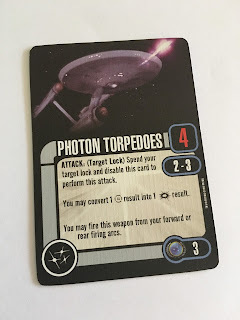 Indeed even the Photon Torpedoes offer the same number as standard however if fired from a Vor'Cha Class you do get to use six dice. There's no specification that it can be fired a certain way, only that it will result in using three Time Tokens. With the note of the use on a Vor'Cha it does push this card to be used on a specific ship which doesn't have a rear firing arc (possibly hence the lack of detail). 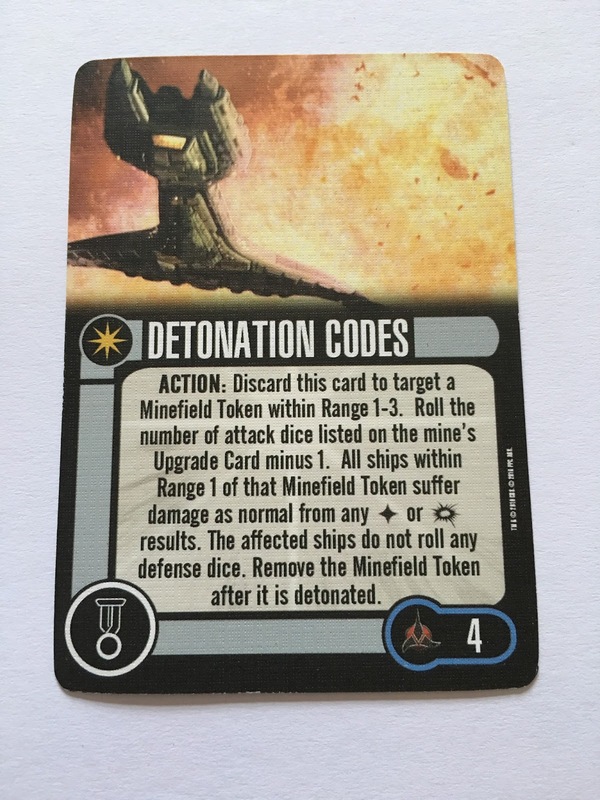 As for the mission cards, the Drovana adds Detonation Codes. 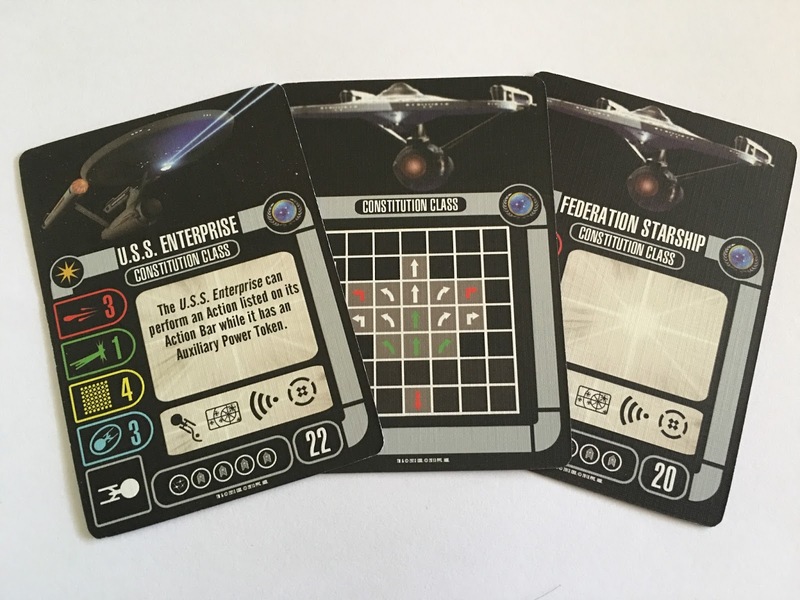 It's a very different mission, placing the Detonation Codes card onto a Federation ship which must be destroyed by two Klingon vessels including one Vor'Cha Cruiser. 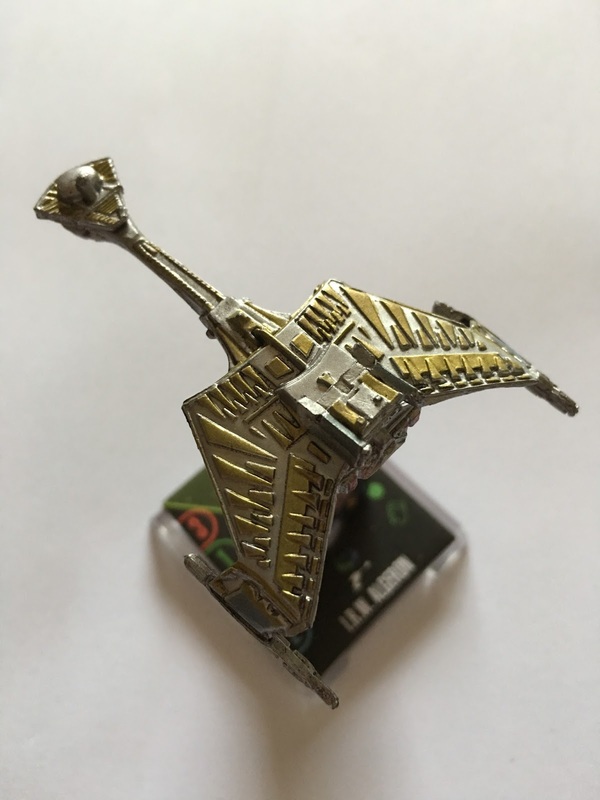 The Federation ship can use the Klingon Elite Action once per turn as the ships skirt in and out of the minefield which is also set in the playing field. 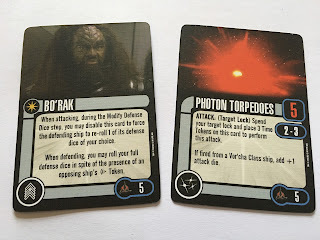 The Federation player can win by damaging one of the Klingons and destroying the other (must be some damage caused by Detonation Codes), both Klingons are destroyed or all the minefield tokens are obliterated. The Romulan ship here in Wave 24 is the IRW Algeron, a member of the D7 Class. A Klingon design given to the Romulans in exchange for cloaking technology (or a cheap reuse for the third season of The Original Series), it's another miniature reboxed. 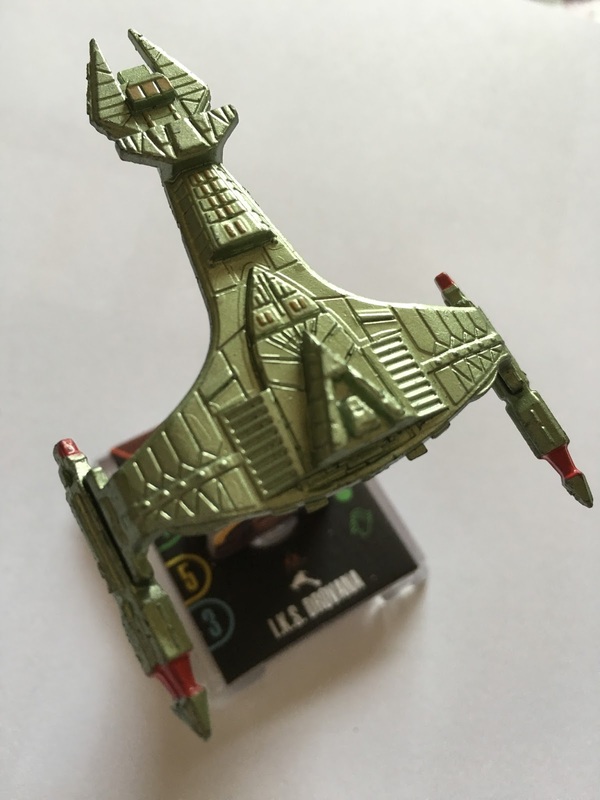 The K'T'inga/D7 cruiser in this pack has a decent paint job and still carries the Klingon emblem on its underbelly which is a disappointment but I suppose re-hacking the mold would be a nightmare. I can't really say a lot on this one aside from the point that the finish is fairly crisp and the engines and bridge module are actually on the right way. The Algeron fires with three dice, defends with one, has a hull score of three and two shields. Standard actions are Evade, Target Lock, Cloak and Sensor Echo with slots for one Tech, Weapon and Crew option. This basic ship will cost you 18 points to field. As for your unique action, the Algeron will let you perform a one speed ahead move before declaring a target as long as you're not cloaked. I love this feature as it will give you a lot of flexibility to get into range for that final shot. Note that there's no limit to when and how often you can use it. The generic Romulan Battlecruiser loses a shield point and the chance of using a Crew upgrade plus the unique action to bring the cost in at 16 points. As to moves, you can max out at a speed of four with only the come about at range three requiring an Auxiliary Power Token to be deployed. There's a full set of turns available at speeds two and three plus green banks and aheads at speeds one and two. This is the standard it seems and it's been a while since we've had a strong, fast ship that gives us a five or a six like Voyager or Prometheus. 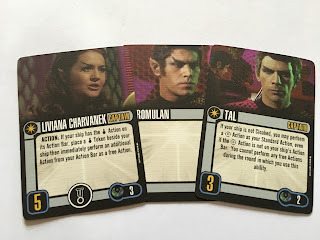 As we said, the pack is based on the third season's The Enterprise Incident with the female Romulan commander, Liviana Charvanek (not her name from the episode for note) as your first choice to captain. With a skill of five she costs three points and does have the badge to perform an Elite Action. Charvanek will let players cloak and then perform a free action during their turn which means you could pack out a turn with this and adding that one manoeuvre in too. This captain can be flipped to a fleet admiral role and therefore pass this action out to other ships in your armada. She does also add one point to the captain of the ship you assign her to. Along with the generic captain card you have a second option to use Tal as your commander. He bears a skill level of three and costs two points and lets your ship use the Battle Stations action even if its not on your standard actions list. 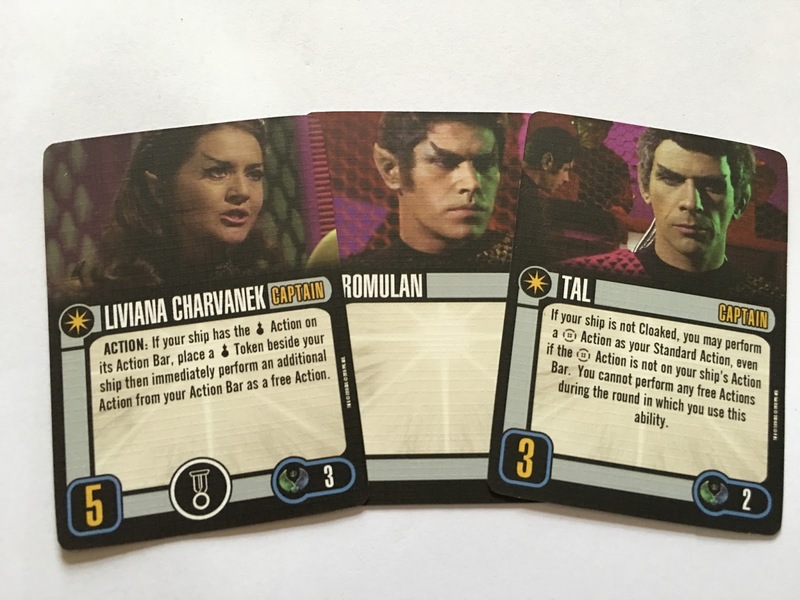 Tal won't allow an extra free Action for that round but for Romulans it will offer more in game chances to bear down on their opponents (as long as you're not cloaked). 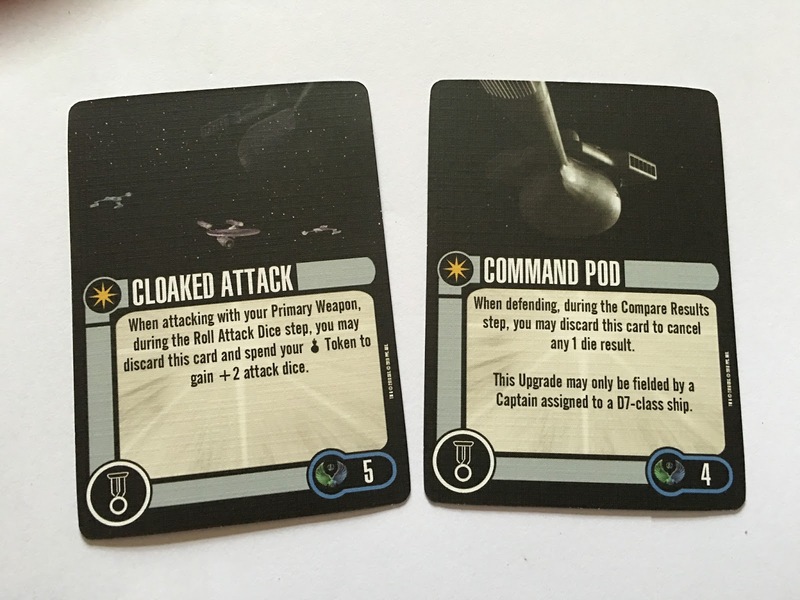 Command Pod is one of two Elite Actions (four points) and simply lets you cancel one die result when defending. It's a discard that can only be used on a D7 Class ship. 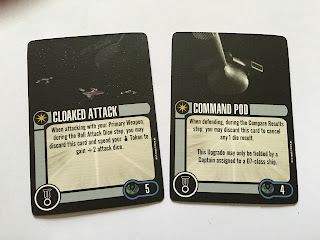 For five points you might want to employ Cloaked Attack where you can discard the card and spend your Cloak token and gain two dice for attack. That would effectively give you a five dice attack with the Algeron which makes it a very strong opponent for a turn - especially when you combine it with the ship's additional move ability and Charvanek's free action for example. That's a lot of bits you can pull in for a single turn. The Weapon slot can be filled with a standard Plasma Torpedoes upgrade giving you four dice in attack and lets you re-roll any blank results. It does incur the Time Token penalty an can be fired fore or aft (if you have those arcs). Nothing new here although very useful and costing three points. There's also a lone Crew upgrade with Romulan Technical Officer (two points) who can be disabled to place a Scan token next to your ship. It's another one of those cards that gives you access to a "standard" action not available with the core ship card as there seems to regularly be with a lot of expansions. The final upgrade here is Impulse Drive which can be disabled to perform a "white" manoeuvre even with an Auxiliary Power Token next to your ship. It does however mean you skip performing an Action for that round. For a two point cost and the fact it can be reused it might be useful however movement-wise there's only the 180 turn that will bring about an Auxiliary Power Token on the Algeron so there might be better ways to spend points or look to assign it to a ship where there are a lot more red turns that you could abuse and therefore warrant the need for this card. The mission also plays to The Enterprise Incident with a Federation ship attempting to outrun three Romulan craft (including a D7) and install a stolen cloaking device. Mission tokens represent steps of installation and once all six are active the device is online. Rolling Damage points will mean that process is successful and if all six rolls have the Damage result then it's a free action. The Romulans need to stop you before exiting the north end of the playing field. Another cool and different scenario to play out that isn't a straight one on one rehash with a planet in the middle. I reckon this could easily be changed to a one player mission with you controlling the Romulans. The big challenge here is that you'll only be able to use a Federation ship with a hull of four or less and Romulans with hulls of three or less. So a good wave overall once you get past the disappointment of some reshuffling between 24/25/26 and having three ships that are repeats. The cards however for the Drovana and the Algeron do offer new features and the missions have some originality which is very refreshing. I'm a bit gutted I have not yet grabbed an Enterprise but from what I understand it's a straight rebox and repaint job from the earlier version. If I acquire I will update! With some scurrying around across the internet I picked up the USS Enterprise NCC-1701 repaint which completes Wave 24. First thing is first - if you've bought the original pack don't bother with this one unless you want a second The Original Series Constitution Class starship because aside from a new silver coat of paint it's the exact same pack. Luckily I didn't so this hasn't been a waste of money because it's a brilliant set of cards even if I fear that the model is so small I could lose it. 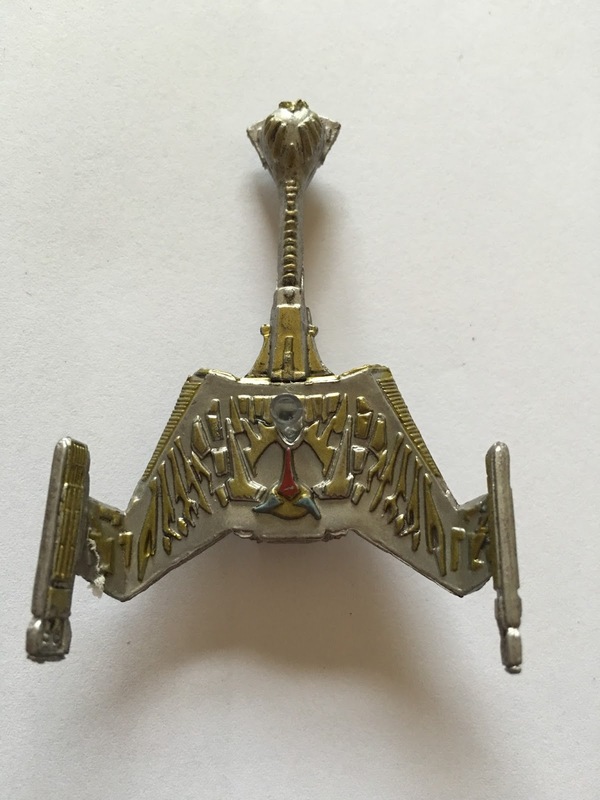 Cudos on the detail of the Tinyprise because Wizkids have managed to add in window detail, get those nacelles aligned and finish the model off with some nice touches such as the red bussard collectors, a golden deflector and a gold, highlighted bridge module. It's not the most stunning item to come out of the game but it does what it needs to do and you can tell exactly what ship it is. I've only seen the original version a couple of times and to be honest there's not a great deal of difference between them. Perhaps the paint job here is a bit neater. The Enterprise has an attack of three, agility of one, four hull points and three shield points. In relation to the refit version that's a single shield point less. 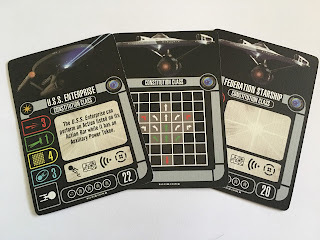 As with all Federation craft we have the standard Evade, Target Lock, Scan and Battle Stations actions as well as four Crew slots and a Weapon slot to upgrade the starship. The basic ship will cost you 22 points. As for its unique action, the Enterprise can still perform an Action from the standard bar even if it has an Auxiliary Power Token assigned. That has to be one of the most useful options available to a ship in the whole game. The generic Constitution Class vessel loses one shield point, two Crew slots plus the unique action to cost 20 points. Movement is pretty flexible with a full set of turns at speeds two and three (sharp right and left on three are red) plus a top speed of four although you can't bank at that level. Speed one will allow bank turns while there's a most welcome speed two reverse to help you back off a bit sharpish. Odd point but the move card and the generic card both carry a picture of the refit Enterprise rather than the one from The Original Series. 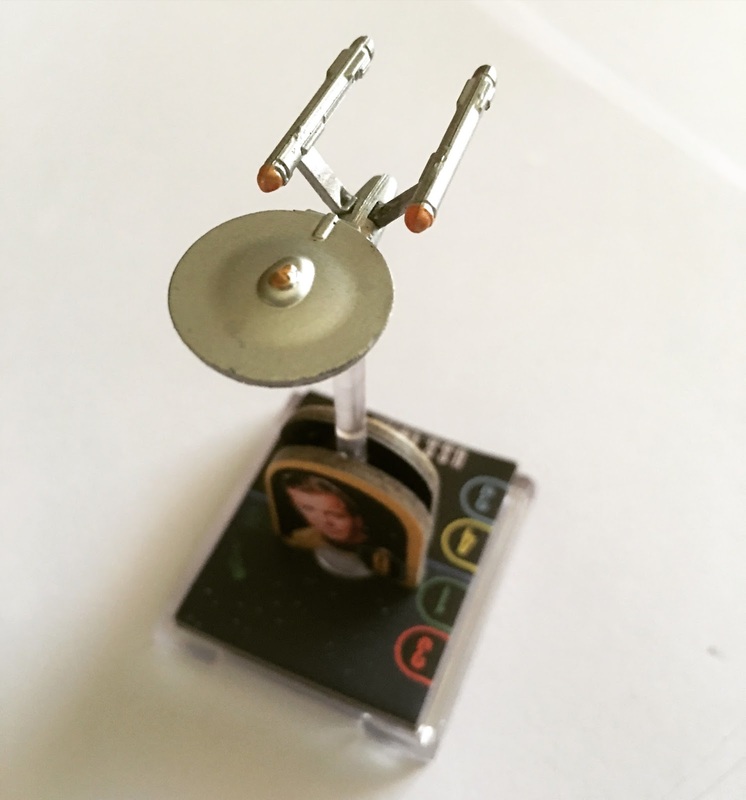 Clearly the first captain option in this pack has to be James T. Kirk (six point cost). Carrying a skill of nine and the ability to field two Elite Actions it has to be one of the go-to command cards for Federation players. 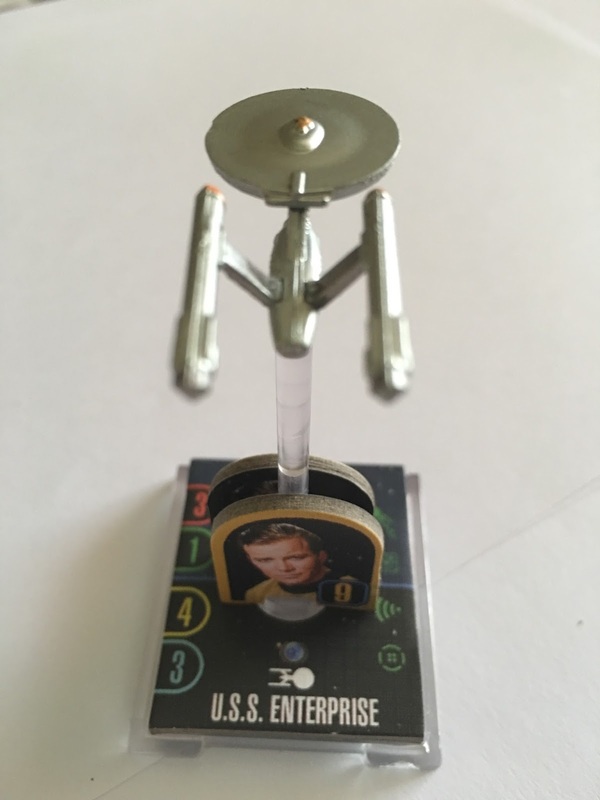 Kirk costs six points and any Elite Action cards you pick for him cost three points regardless of their face value. Also being able to keep them face down until "activated" means other players can't see what you're planning although I expect Cheat Death will be in there. Second option is Christopher Pike. A logical choice since the movie version has Decker. While not as amazing as the Kirk card, Pike does offer a skill of six for four points and has an Elite Action slot so don't dismiss him straight away. He'll also mean that those Crew upgrades cost a point less each and considering the Enterprise can take up to four that's a good saving when it comes to budgeting. Finally there's the generic captain with a skill of one and a zero point cost. It uses the image of Ron Tracey from The Omega Factor and I would have liked to have seen him as a "proper" captain rather than to fill out a useless card. You get five Crew choices with the Enterprise with only Chekov not making the cut of the standard crew (no sign of a Rand of a Chapel card either but y'know...). 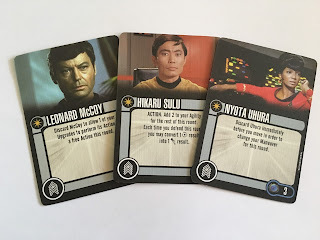 Both Spock and Montgomery Scott cost five points to equip while Sulu, Uhura and McCoy cost three. Spock allows players to convert Battle Station results into damage during an attack as long as your ship carries the Scan token. Nicely there's zero need to disable or discard this one wich makes it eternally useful not does it say that you can't utilise the Scan ability when altering your attack result. Scotty offers a double advantage which, like Spock, makes that higher cost much more appealling. Firstly he can be used to disable two shield points and add two attack dice (in the case of Enterprise it would take you up to a five) or you can reduce the attack roll by two dice and repair a shield. Super useful and that second one doesn't specify the need for the engineer to be disabled. This is another huge win card and beyond question one that you will always want to have on the table. So to the three pointers and Leonard McCoy. Offering a "medical" alternative, the good doctor will let one of the other Crew upgrades operate as a freebie for that round. He is a discard so make that one extra ability count! Sulu on the other hand doesn't specify that discard/disable handicap and adds two dice to your defence (agility) for the round. It is an Action so you have to note it's enabled rather than it just being there all the time. Potentially one to use with McCoy depending on how bad things are getting! 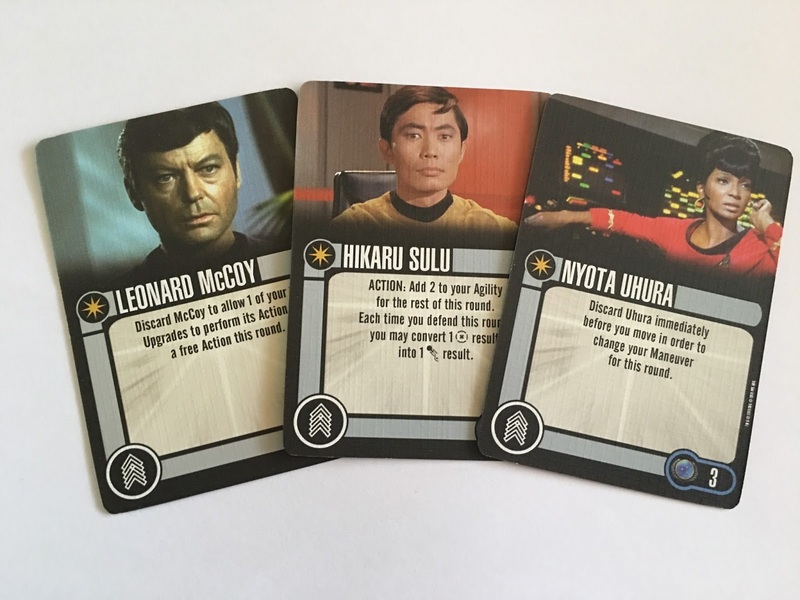 Sulu will also let you convert a Battle Stations result into an Evade during the round in which you declare him active. Finally there's Nyota Uhura who is again a discard but will let you change your manoeuvre before you move. It's a bit of a classic card and one that helps a lot especially if you're loaded with a high skilled captain (i.e. Kirk). Does mean you can check out the enemy and then do what you need to do to better position for the next round. 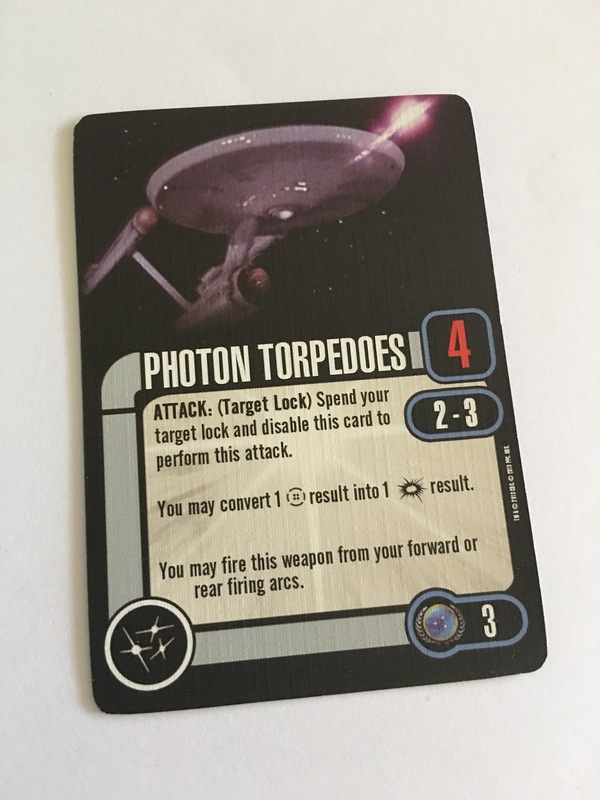 As for Weapons you get just the original version of Photon Torpedoes (cost of three points). Yep, that's right it literally is a repack with not even a Time Token update for the later waves. In fact even the inners of the packaging are from the original box and there's no reference to it being part of wave 24. This does make me think it might have been a very late - and cheap - swap for something else. Photon Torpedoes here still utilises the disable feature which hasn't been used for a while now. Standard two to three range here with an increase to four dice and the chance to convert one Battle Stations result into a Critical Damage hit. 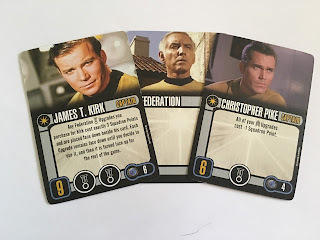 Unusually the pack has three Elite Action cards included all costing five points individually (or three if coupled with Kirk). Cochrane Deceleration Maneuver is a discard which lets you Come About right after performing a forward speed one move but will incur the old Auxiliary Power Token penalty. A risky move but one that could well put you into a much better firing position and turn that retreat into an attack. Chancey but if the enemy don't know it's coming it will be a big surprise. Second you have Corbomite Maneuver taking its name from the classic first season story. Again a discard it stops you being attacked but you can't go on the offensive either. Might give you a chance to reform your fleet and get some repairs completed. Last but by no means least is one of the most controversial cards in the history of Attack Wing; Cheat Death. Man have I heard about this one over the years! If you're destroyed then you get to remove one Damage Card at a time until the amount of damage is one less than your Hull Value and then you can flip the remaining card face down which eliminates their effects on your ship. I guess this means one Damage Card per round so for the Enterprise for example you can ignore the fact you've been obliterated and then each of the next three rounds you remove a Damage Card. The remaining card is then turned over and treated as normal damage. You can see why that's caused a stink and certainly if you're playing Kirk and this is hidden face down its going to always be ready to play. Probably the biggest game changer but with your enemies always assuming it'll be played, whatever ship it's on will be taken out damn quickly. 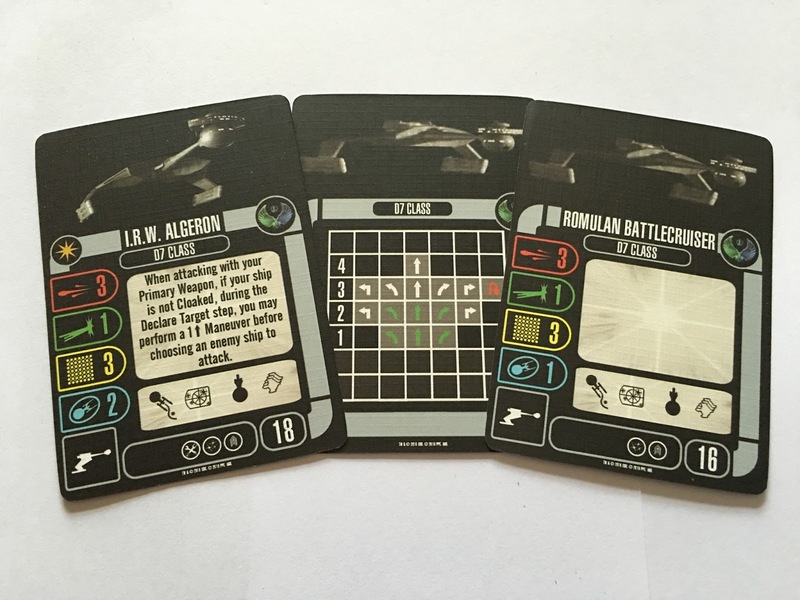 The legendary Kobayashi Maru scenario comes with the Enterprise pitting your 50 point ship against a triple Klingon threat of 80 points. 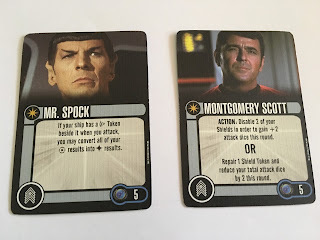 Set out as a standard two player game it's all about strength of character as it's severely weighted to the Klingons. Will you rescue the stricken freighter or die trying? Sadly there's no chance to just re-programme the simulator and win. Dammit. I don't believe in a no win scenario!!! For anyone who already has the USS Enterprise from Wave Zero I wouldn't bother. I'm happy to have been able to find it given that the earlier one is a hard find (not as hard as Excelsior) and there are some serious killer upgrades in this set that you would be stupid to miss out on. Late adopters will find this pack one of the most essential to get their hands on and use if only for that Cheat Death although the crew choices are solid as well. What Wave 25 will look like is potentially still in the air as I've had trouble locating exactly what it will include and it's been a while since the Wave 24 previews. It might be a shuttle, a revamped Negh'Var, Xindi. Who knows - will we even get a wave 25 or are we going to be looking at Frontiers...? What are you waiting for? Are the Klingon and Romulan expansions here what you wanted?